Sometimes you need to destroy something really tall, and for that, you need a really tall demolisher. These behind the scenes videos from High Reach Demolition of the tallest demolisher in the world were shot during the demolition of the Langerbrugge Powerplant, a generating station erected in 1959 in the Ghent Canal area of Belgium. Having served its useful life, decommission of the power plant was started, and the engineers working on the project brought in an absolute beast to help them tear down this massive complex. The Cat 5110B HRD 88 is a massive machine with a 288-foot arm reach. 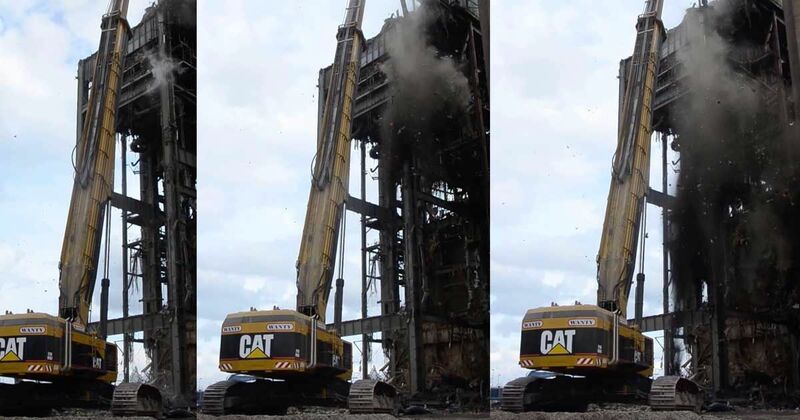 Built primarily for large-scale demolition projects, this Cat is in a class of its own – it can use buckets and work tools weighing over 10 tons. One can easily forget the giant size of this piece of heavy machinery; an average person 6 foot in height is only as tall as one of the tracks. With a heavily protected cab and reinforced hydraulic lines, the Cat is made for tearing through work that other pieces of equipment would struggle to reach halfway up. With nearly 800 horsepower and an operating weight of 280,000 pounds, it’s not the nippiest machine on the block, with a top speed of just 2.1 mph. 16 feet tall, 18 feet wide, and 28 feet long, it can hold 450 gallons of diesel fuel and requires an equal amount of hydraulic fluid. The engine oil reservoir alone is 22 gallons. For the biggest, roughest jobs, the Cat 5110B is the way to go. Check out the video below, and SHARE if you like it. Ever wonder how a 12-foot, 7-ton crankshaft gets repaired? Check out this video of a massive oil industry crankshaft being repaired by the best in the business.